The Confidential has been having some fun with league-wide coaches Mount Rushmores. Football and Basketball, plus polls for each of football and basketball to share your thoughts. In fact, it was so sufficiently fun and controversial that we are going to do school-wide Mount Rushmores now. And we will only put three people on the list, leaving you–our readers–to comment as to who should be the fourth. We will not do polls anymore. For today, let’s go with a school with a rich ACC history: Clemson. The Confidential gives the first spot to Danny Ford. Clemson has one national title in football. That was in 1981–a team coached by Danny Ford. The 1980’s were very good to Clemson, as the team went 96-29 under Ford, including six ACC titles. Ford went 6-2 in bowl games also. Although Ford had some, ahem, “issues”… with the rules… a national championship is special for a university. And Ford brought one to Clemson. 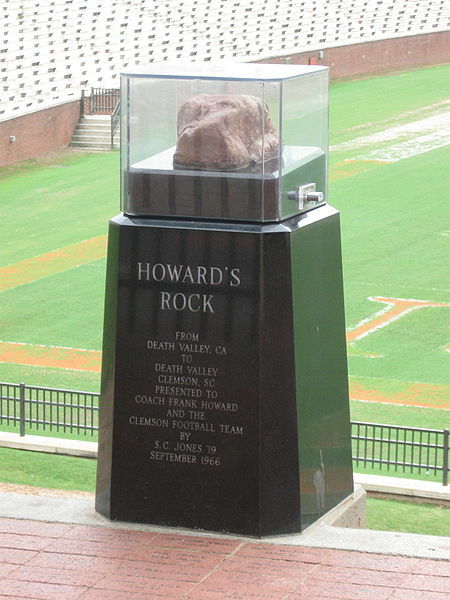 Howard’s Rock, courtesy of Wikipedia. The #3 spot is, as always, a tough one. The Confidential will select Larry Nance. Clemson’s hoops performance has been spotty, less than a dozen appearances in the Big Dance. But Nance led the Tigers to an elite eight in 1980–the best finish ever. Nance also had a lengthy NBA career, where he was a very reliable source of rebounds, blocked shots, and secondary scoring. Nance also won the NBA’s very first slam dunk contest. And that leads us to the number four spot. A lot of football players here… CJ Spiller, Terry Kinard, Steve Fuller, Banks McFadden, Brian Dawkins, and William “The Refrigerator” Perry, among others. On the baseball side, Jimmy Key is probably the alum with the most MLB success, but Bill Wilhelm and Jack Leggett have coached Clemson from 1958 to present, amassing nearly 2,000 wins between them. Surely there are plenty others. This is where you come in–let us know who should be #4.
Who will be the Confidential’s fourth Clemson Tiger on its Mount Rushmore?